It is a striking contrast between the ease with which I can get precious data from my social network anytime I need it versus the unbelievable waste of time answering the very same question in two or three redundant forms used to screen me as a supplier. This contrast leads me to conclude we are witnessing the formation of a new chasm. 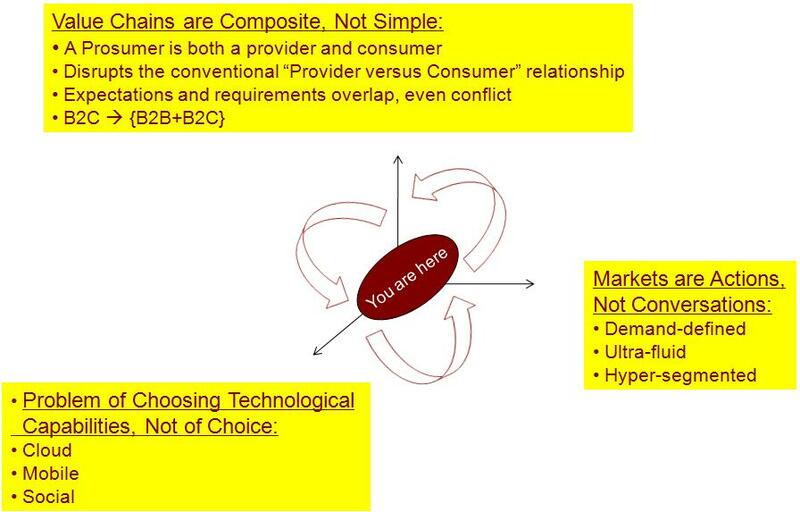 It is between companies who stick to their old bureaucratic patterns with respect to suppliers versus those that realize that a supplier these days is a “prosumer.” He/she might provide services one day, consume (other) services the other day. The business opportunity this chasm presents is providing efficient marketplace infrastructures. Anyone who can collect my data once and provide it as needed to multiple companies I interact with as a supplier will be doing me, and countless number of social networking aficionado, a huge service. Time is simply too precious to be wasted typing in the maiden name of my mother multiple times. Recommendation: Examine the way your company acquires new customers versus the way it brings aboard suppliers. Something is wrong if your company’s procurement folks routinely tell suppliers “we know you have already given this information, but ‘they’ would not accept it from ‘us’ if you don’t fill this extra form as well.” This being the case, you need to rethink your approach to composite value chains.